Progressives are reportedly "wary" Sen. Cory Booker (D., N.J.) is not far left enough and question the prospective 2020 candidate's ties to Trump administration official Betsy DeVos and Wall Street. "For the most part he votes the right way. He really went out there in 2018, went above and beyond," Rebecca Katz, a progressive political strategist, told the Philadelphia Inquirer. "But I do think progressives are wary of his record." The newspaper reports the left has "long questioned Booker's ties to wealthy interests, including Wall Street, Silicon Valley, and pharmaceutical companies, his coziness with former Gov. Chris Christie, a Republican, and his advocacy for charter schools, including links to President Trump's education secretary, Betsy DeVos." Booker received more money from Wall Street than any other member of Congress in 2014. He is also drawing the ire of teachers’ unions for serving on the board of the Alliance for School Choice, a charter school advocacy started by DeVos. "Education wise, he's not far removed from a Betsy DeVos philosophically," said John Abeigon, president of the Newark Teachers Union. "It's sad because we support him on most issues," he said. "But that's a major issue. That's a major stumbling block." 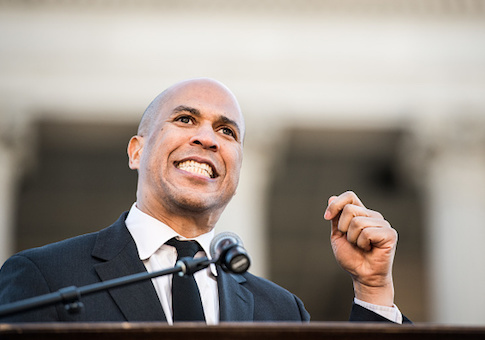 "Others note that Booker has long received significant campaign support from people who work on Wall Street or at major pharmaceutical companies, both major employers for New Jerseyans," the Inquirer reported. Perceptions of moderation could be a liability in the nascent 2020 Democratic primary, which has already included calls by Sen. Kamala Harris to "eliminate all of" private health insurance and Sen. Elizabeth Warren's (D., Mass.) plans to tax the assets of wealthy Americans. Other activists say Booker is on board with the liberal agenda. "On the core issues like LGBT, abortion and marijuana reform, and criminal justice reform, he's like A-plus-plus-plus-plus-plus," said Jay Lassiter, a liberal activist and former Bernie Sanders supporter. Booker recently appeared on an episode of National Geographic’s Explorer to discuss "environmental racism."